Just under three years ago I wrote about a climatologist who was fighting against some libel of his work. The case recently had an update so this is a rare Observation Deck article sequel (!). Dr. Michael Mann (who, yes, shares a first and last name with a television/film writer/director/producer) is the director of the Earth System Science Center at Pennsylvania State University. One of his first major publications, Mann et al. 1998, became (in)famous for strongly showing that Earth’s mean surface temperature had been relatively flat for centuries and then quickly rose in the 20th century. 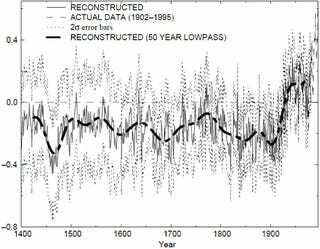 This “hockey stick” trend in Earth’s mean surface temperatures has been found in many, many subsequent publications but because Mann was the lead author of one of the first papers to strongly show it, it became “his” finding. This (in)famy has made Dr. Mann the target of a relatively large amount of harassment from conservative pundits. This situation was not helped by CRUhack: a late 2009 incident in which the University of East Anglia’s Climate Research Unit’s online databases were hacked and select private emails were publicly uploaded with the unstated purpose of intimidating climate researchers by “exposing” their work. Dr. Mann was one of the people involved in these emails, and over the next ~2.5 years, several organizations investigated Dr. Mann’s work in light of many many allegations raised by people concern-trolling after CRUhack. None of these investigations found him guilty of anything, and two particular pundits in 2012 felt that that was bunk. Dr. Mann felt that being compared to a serial child molester and being told that his work was fraudulent was rude, so he filed a lawsuit against the two authors and their publications; as of late January 2014 that’s where things were. Rand Simberg is still out there writing articles for, among other places, the Competitive Enterprise Institute and Popular Mechanics. He still writes for his blog which links to io9 on occasion so I guess we can count him as a fellow io9 fan. Last Thursday the District of Columbia Court of Appeals handed down a 111 page decision stating ... well, stating a lot, it’s a 111 page court decision. But to briefly summarize it stated that Dr. Mann has a valid legal concern and that an earlier claim by Simberg, the CEI, and National Review that the case should be dismissed was bunk. (Steyn was not in agreement, he thinks the case should just immediately go to trial). Steyn, of course, was not happy. National Review was not happy. They both think their actions were covered by the First Amendment. Simberg had no stated opinion before talking to his legal counsel; at that link he quotes the CEI’s response. I continue to be really hesitant about committing fully to either side. On the one hand I agree in part with some of the points that Jonathan Adler, writing for the Washington Post, is bringing up. While a direct accusation of scientific fraud may be actionable — particularly when made against a non-public figure — challenges to scientific conclusions and interpretations of scientific studies are clearly protected by the First Amendment. So are erroneous interpretations of scientific conclusions and — particularly relevant here — criticisms of the conclusions of investigatory bodies. Because that’s half of who Simberg and Steyn were aiming at: they were saying that the Pennsylvania State University’s investigation into Dr. Mann’s conduct was bad, and that Dr. Mann was guilty of misconduct regardless of what the PSU investigation had said. But on the other hand Steyn, Simberg, and Adler all are focusing on the findings of one investigatory body when three looked into Dr. Mann’s research. This is weird on Adler’s part because the article I linked just above quotes an article of his from three years ago mentioning that the National Science Foundation had also investigated Dr. Mann. If three separate investigations all found Dr. Mann not guilty of scientific fraud, then what’s the motivation of Steyn and Simberg in accusing Dr. Mann of scientific fraud? It doesn’t seem to be in spreading truth or reporting honestly, so I don’t think it’s unreasonable for a jury to conclude that Steyn and Simberg are both interested in defaming a scientist who they disagree with. But on the gripping hand there are some really basic court-related issues on just how legally sound all of this is. For example the issue of whether or not Dr. Mann is a public figure; if he was unheard of in 2012 and Steyn and Simberg’s statements had suddenly caused him to gain national or international attention, then that was almost certainly intentional defamation. But Dr. Mann in 2012 already had a reputation (which he gained via his social media presence and blogging) for not putting up with non-scientists giving him grief. Heck I’ve read comments on the Gizmodo Media websites from non-scientists giving the guy grief; among people talking about climate science and its connection to public discourse he has about a decade of being reasonably well-known. There is a long long long (long) history of scientists verbally attacking one another’s research conclusions and personal character but usually that level of directness doesn’t spill over into punditry. There’s lots of pundits who have gone on tv and said that environmental tobacco smoke (AKA secondhand smoking) doesn’t cause cancer but it’s difficult to find one who directly accused particular medical researchers of committing research fraud. Climate science contrarianism became deeply personal in the mid-2000s; Al Gore tied his name tightly to climate science in 2006 and conservatives who already had problems with the “let’s not just burn fossil fuels all the time” policies that scientific conclusions advised just got more ammunition for their narrative that “global warming is just a liberal agenda”. A decade later things haven’t really gotten better; Gore is still out there being a target for attacks: expect a wave of more op-eds about him in a few weeks when An Inconvenient Truth’s sequel premieres 19 January at the 2017 Sundance Film Festival and when it releases to a larger number of theatres later in the year. Dr. Mann shouldn’t have to put up with being compared to a serial child molester; it doesn’t matter if he’s a publicly-known scientist, that kind of aggressive verbal attack is just plain unnecessary. But there’s a very blurry line separating protected criticism and criminal libel, and even blurrier lines about the responsibility of editors, authors, and publishers of critical speech. Gizmodo Media will gladly tell you that the exact location of these lines is getting harder and harder to find as the world gets meaner and more litigious.